The human body has been designed by evolutionary processes to be as efficient as possible so it’s ready when food is scarce and stress is rampant. Having nothing to eat was the plain reality until only a few centuries, for a large percentage of the world’s population, but as it usually goes in evolution, the human body adapted and overcame. This means that it developed systems ready to handle the scarcity of nutrients but still survive. In regards to stress, our bodies developed a fight-or-flight impulse which puts a lot of intensity on your system when you’re under stress. 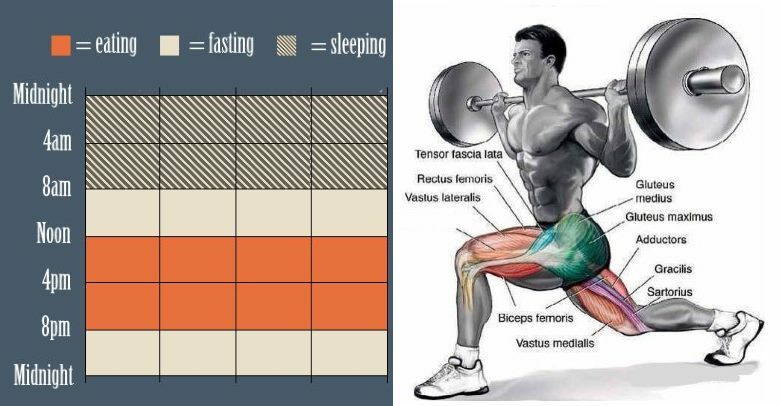 If you combine intermittent fasting and high intensity exercise, you will stimulate the production of hormones which will improve tissue healing and the processes of the metabolism. Back in prehistoric times, the ancestors to the modern humans had one job – stay alive. In order to do that, they would have to eat at least once a day, if not more, so for this they quickly learned that nature can provide everything – berries, herbs, seeds and nuts were just a few of the treasures they discovered when foraging through bushes. Later in the day, these people would have a high-protein, high-fat meal that would consist of whatever they killed that day. As you might imagine, it’s never certain if the tribe will catch animals to eat, so fasting was just another way of having no food. The adaptation that our body creates is easy to recognize – when you fast, your body goes through some positive changes. Fasting is literally entering into catabolism, which means that your muscle tissue will disintegrate. Fasting allows this, but it also holds back on stimulating any inflammatory conditions, which lets the body clear out the old and damaged cells and create new, strong cells and cellular components in their stead. Back before we had civilization, doing high-intensity exercise wasn’t something that the cave people would prepare all day for. It mostly consisted of hunting (on foot!) for animals, participating in physical fighting with another tribe or soon another civilization. This allowed our fight-or-flight impulse to develop to an even higher level, which means it became even more intense – ninety to a hundred percent of the maximum intensity. You didn’t hunt, you didn’t eat, but that’s not the only thing to take away here. A bigger problem is the fact that our ancestors were usually built pretty muscular and they would probably not do too bad in a modern contest. However, if you want your life to be good now, you have to know, understand and put into practice all possible harmony with how people made life good for them earlier and what kind of physical characteristics did they develop. If you want to have the body of a beast human from the prehistoric era, you should try intermittent fasting and high-intensity, short but durational exercises will get you almost to the finish line. Across the finish line, of course, you will be escorted by having the right genetic predisposition. The fight-or-flight response or other responses help our body by giving us a better survival chance in the world, as well as constant adaptation, thriving and evolution. When you start doing this, you will start to experience the benefits of your work, such as stronger and bigger muscles, an immune system that can withstand anything and a digestive tract that will be tough as nails. You can combine intermittent fasting for anywhere lasting from a half a day to a full day, so from 12 to 14 hours, with high-intensity workouts. This has been proven to boost your human growth hormone production, which is a vital hormone created in the pituitary gland. Also, the human growth hormone speeds up the cellular repair processes and lets us age like fine wine. It also keeps you calm, builds muscles and burns fat by regulating your metabolism. The Intermountain Medical Center Heart Institute discovered that men who had committed to intermittent fasting for a full day had over twenty times the human growth hormone than those who didn’t. The increase in women was about thirteen times, still pretty amazing. Another study in 2009 came out in the British Journal of Sports Medicine, which said that lactic acid is the cause of the boost in production of the human growth hormone. Lactic acid is created in your body when you perform anaerobic exercises only! This is because when you perform an aerobic training, your body is not tense and it does not provide the adequate environment for the production of necessary lactates. When you have long, aerobic but low-intensity workouts, you are practically living in catabolism. After one of these sessions, you will have a lot more free radicals in your body. However, the amount of free radicals is not mirrored in the amount of peptides, hormones and enzymes. When you put it all together, though – it’s still worth it! When the repair peptides, hormones and enzymes are inside the body and about to be unleashed, there is an increase in healthy tissue repair and good, beneficial effects on the human body.